Discover the ancient power of your creativity. The Foundation for the Spiritual Practice of Creativity teaches a spiritual practice that deepens your relationship with your creative power, reconnects you with the intelligence of life, and facilitates the awakening of you as consciousness. Creation is the energy, the life-giving force that keeps the universe in motion. It is the power that keeps all of Nature moving, shifting, and unfolding in a variety of magnificent ways. And it is the power that is animating your entire existtence. Creation is happening right now, across dimensions of time, and through and as the human being. Fundamentally, an individual does not exist as a separate being, but rather as an indivisible expression of what connects all of us, the underlying, interconnected sacred and generative field of nothingness. From this inner field of no-thing-ness, an exquisite vitality emerges. We know this vitality as life itself. It is holy. It is abundant. And yes, it is sexual. Signup for news, events, meditations, and more! Learn the basics for free. 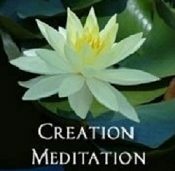 Then make Creation Meditation your daily practice. Discover tools that can support your spiritual practice, deepen your wisdom, and guide your spiritual journey.